Working with you, every step of the way . . . Extreme Graphics seeks to build positive relationships with its employees, clients and vendors to support a fruitful and rewarding business community. We are committed to acting as a valuable service partner in managing and satisfying our customers' needs. At Extreme Graphics we understand that the success of any plan lies in the strength of its foundation. That is why we launch nearly all projects by dedicating time to meet with our clients to understand their entire job scope. We begin by anaylizing the job details, then offering concepts and ideas to enhance the final objective, and finally reviewing the deadlines to coordinate proper execution. All the while anticipating possible challenges that may arise along the way. The Extreme Graphics creative team is highly knowledgeable and experienced at putting your ideas to work for you. Our design process begins with the initial retrieval of digital data, brainstorming, conceptualizing, proofing and approvals. Our creative team is skilled at creating nearly any kind of print artwork using the latest trends in design and technology. All of our designs are original and created specifically for your needs; in the style that best matches your personality and branding. 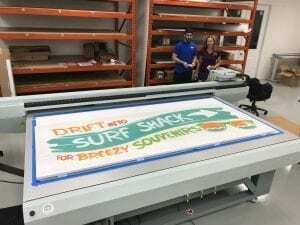 Extreme Graphics produces sharp, colorful indoor, outdoor graphics & signage by utilizing the industry's cutting edge, high-res print technologies. We employ a wide assortment of medias and substrates to offer our clients unique and dependable graphics for a variety of applications. With highly efficient digital printers, we have the ability to produce small quantities with a fast turnaround. Whether you need 1 item or 1000, we can print your products quickly! Our industry expertise ensures consistent color and quality images. We offer our clients a variety of creative printing options to meet their project needs. 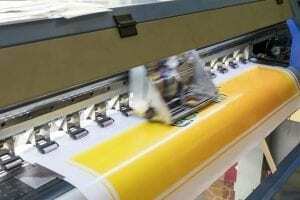 Our printing options include roll-to-roll, UV flatbed (direct to substrate), and dye sublimation. Our high-resolution eco-solvent 9-color printers offer exceptional color, photographic print quality and durability both for indoor and outdoor applications. Substrates include canvas, banner, fabric, paper, vinyl, window films and much more in a variety of sheens, colors and textures. Imagine direct printing to almost anything that is reasonably flat, up to 2" thick, up to 4' x 8' either single or double-sided. This printing process utilizes a four-color ink set and offers a wide color gamut with great durability both for indoor and outdoor use. There are a variety of substrates available that are designed specifically for UV flatbed printing, which include foam board, PVC board (Sintra), styrene, aluminum composite material, corrugated plastic and more. Additionally, exotic materials like wood, metal, glass, plastic, leather, fabrics, tile, flooring, and much more can be printed to create new and exciting design possibilities for exhibits, events, interior décor, retail and more. Taking color vibrancy and crisp images to the next level, dye sublimation printing provides amazing print quality. This printer utilizes four-color, high-density black technology that is second to none. Each image showcases vibrant colors, intense blacks, sharp contours and smooth gradations. Once printed, the image is then heat pressed to an assortment of substrates that include: aluminum (Chromaluxe), plastic, wood (maple), glass tile, fabric and more. 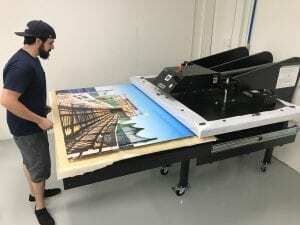 Prints are then finished with hardware to be hung as a floating, framed, framed/floating or installed with standoffs. These prints are scratch resistant, waterproof and are easy to clean. We're Green! 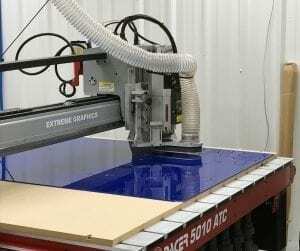 Over the years, Extreme Graphics has continued to seek out ways to incorporate green initiatives into our manufacturing process and work environment. From the use of pre and post-consumer recycled materials (recyclable), eco-sensitive inks and coatings, we are able to offer our clients products that help reduce our impact on the environment. Over the last 20 years, Extreme Graphics has welcomed a variety of creative, unique, and challenging jobs. This exposure has afforded us the opportunity to grow and develop the expertise to produce a variety of creative products. From 3-dimensional custom displays, lettering, logos, signage and much more our Extreme Team strives to surpass our clients' expectations on each job. Our staff focuses on quality workmanship by paying attention to the details. Thereby, producing creative, durable graphic images, signs and displays. 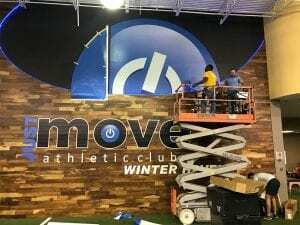 The Extreme Graphics professional installation team will ensure that your graphics, signs and displays are safely and properly installed in a timely manner. Our experienced staff will arrive promptly, prepare a safe space, expertly install the job and leave the area clean. Always completing the job with your satisfaction in mind.